Every home needs a thorough cleaning at least once a year to keep things looking shiny and new. Jump into spring cleaning this year with this basic checklist of quick projects. This guide will teach you 7 essential spring cleaning projects you can undertake to get your spring started. Use a four bin cleaning system to eliminate clutter around your home. Approach the closet, garage, toy rooms, storage, game rooms, etc., and label four containers: Keep, Give Away, Repair, Trash. If something is damaged beyond repair, or has outrun its usefulness and would be unfit to donate, that goes to the trash pile. Anything that just needs a little extra TLC should go into the repair pile to be fixed at a later date. Give away anything that you haven’t used in the last year. Check your local donation center's website to learn their specific donation needs and requirements. Keep what remains and reorganize in clear containers so the contents can be easily identified. Store winter clothing and bring warm-weather clothes to the front of your closet. 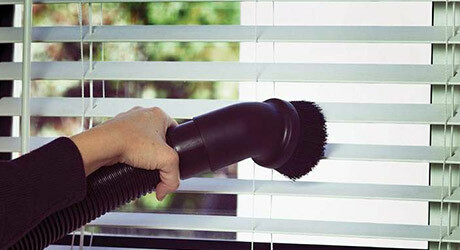 Clean your windows inside and out. Use a damp cloth to wipe down the window's ledge and frame, and if necessary, apply wood polish to the frame. If your window has a grid, remove that and clean separately. 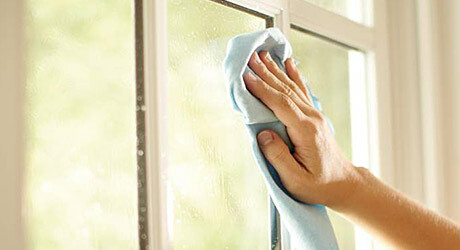 Use glass cleaner and a paper towel or squeegee to clean the window's interior. To clean the exterior side of the window, first use a hose on a low or medium pressure setting to spray off excess dirt and pollen. If you don't have a tall ladder or would prefer the safety of remaining on the ground, use telescopic scrubbers to reach the windows. If you want to use a window cleaner, get a bottle specifically designed for use with a hose and attach it on the nozzle. Spray the solution onto your windows, then scrub, rinse with clean water, and let dry. 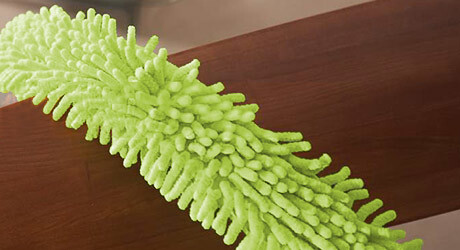 Using a telescopic pole duster, rid your space of spider webs along the crease where walls and ceiling meet. Wipe down corners and move down along the corners and walls, dusting art and lighting fixtures along the way. Remember to clean air vents, doorknobs, doors, and switch plates using an anti-bacterial cleaner. Clean your ceiling fan and blades, then wipe down your baseboards and finish up with a final dusting over everything in the room and a good vacuum of the floor to pick up all the grime and dust that has accumulated. Remove books and knickknacks from shelves and wipe them down. Move all your stationary furniture out of the way and vacuum underneath – you’ll be surprised at what you find hiding under the couch. Remove your drapes and curtains from the windows and shake them out on your porch or give them a quick once over with the vacuum attachment to rid them of excess dust, then wash according to their label. Use an attachment to vacuum your blinds, couches, and chair cushions, wipe down leather with a specialty formulated cleaning solution, and wash any pillows according to manufacturer's instructions. Wipe down all baseboards and tough-to-reach corners of the house. Vacuum then wash any rugs or mats, then vacuum all carpeted areas, and use a carpet cleaner to make your floor look brand new. For hardwood or tiled floors, sweep thoroughly then vacuum on your cleaner's bare floor setting. Use a cleaner designed specifically for your floor type to remove stubborn grime, then polish. Follow manufacturer’s instructions to clean your oven. Remove all stove top burner pans and clean using a cleaner and brush, or replace with new ones. Dispose any expired food from the fridge, freezer and pantry, and wipee down the area. Empty the pans for your toaster and wipe down your coffee maker, mixer, and any other frequently used kitchen appliances. Clean out your drawers and wipe down everything with a germ-killing cleaner. 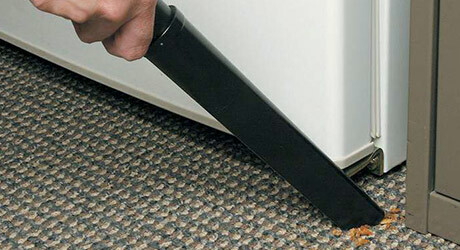 Gently clean your refrigerator condenser coils using a coil brush. This will help save energy and remove buildup, extending the life of your refrigerator. 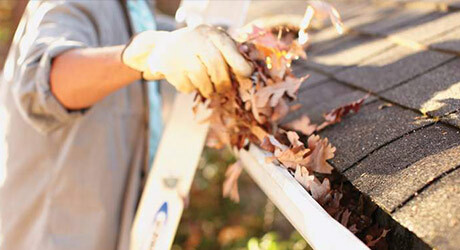 Clean gutters manually while wearing thick gloves, or remain safely on the ground and use a telescopic pole with cleaning attachments. Remove patio furniture, sweep off debris, then clean the patio using a pressure washer. Clean furniture frames using a damp cloth and cleaner, and wash patio cushions according to manufacturer's instructions.